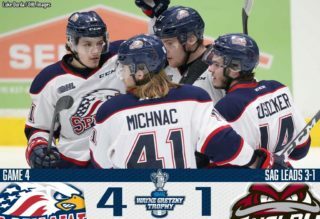 Saginaw, MI – The Saginaw Spirit took game-one of the Ontario Hockey League (OHL) playoffs’ Western Conference Quarter-Final series Thursday evening, 6-3 against the Sarnia Sting. The Spirit recovered from a sluggish start to score six times in the last two periods. Arizona Coyotes prospect Ivan Prosvetov made 34 saves for the victory in his OHL post-season debut. 2017 Florida Panthers first round pick Owen Tippett collected first-star honors with three points. March’s OHL goaltender of the month Ivan Prosvetov was tested early and often in the first period. Sarnia controlled most of the play in the first frame and the Spirit net-minder had to make several big saves. The Sting’s Hugo Leufvenius opened the scoring 4:41 into the first period of play. Overager Franco Sproviero slid a puck to the left face-off circle for Leufvenius to one-time into the Spirit net. Leufvenius led all Sarnia players with 37 goals and 81 points in the regular season. Arizona Coyotes fourth round pick Prosvetov came up big for the Spirit after the Sting was given a long five-on-three man-power advantage. The Russian goaltender stopped point shots from defenseman Nick Grima and Vancouver Canucks signee Mitch Eliot to help kill a huge power play. The Spirit’s best scoring chance in the first period came shorthanded on a two-on-one rush. Detroit Red Wings prospect Brady Gilmour sent a nice saucer pass over to 2019 NHL Draft prospect Nicholas Porco. Porco’s wrist shot from the right face-off beat Sarnia net-minder Ethan Langevin but clanked off the post. The Sting took a two-goal lead with three seconds remaining in the opening frame with Leufvenius’ second goal of the game. Sproviero pass from behind the net set up the Sarnia left-winger in the slot for the tip-in goal. Saginaw struggled to get momentum in the first period and the Sting outshot the Spirit, 14-2 in the first 20 minutes. The Spirit opened the second period with a flurry of scoring chances. 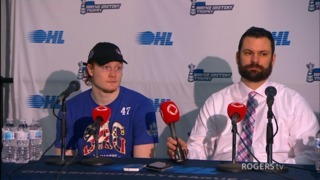 Jackson, Michigan native Blade Jenkins put Saginaw on the goal with his first career OHL playoff goal. New York Islander’s second round pick Bode Wilde’s pass deflected off Gilmour’s skate right on to Jenkins’ stick in the slot. Jenkins deked around Langevin and slid the puck into the open net. 2018 New York Islanders fifth round pick Jenkins notched his first career OHL playoffs goal on the play. The Spirit center had three assists in four career post-season games. 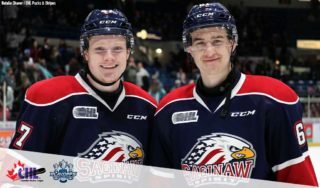 Two Saginaw rookies combined to bring the Spirit even just under two minutes later. Regular season OHL rookie scoring leader Cole Perfetti’s nice lead pass sprung right-winger Ethan Cardwell on a breakaway. Cardwell sped into the Sarnia zone and sent a wrist shot through the Sting net-minder’s five-hole for his first career OHL playoff tally. Saginaw’s third goal came just 15 seconds later with a nice wrist shot from 2017 Florida Panthers 10th overall pick Owen Tippett. Edmonton Oilers prospect Ryan McLeod sent a pass from the corner over to Tippett in the left face-off dot. The Spirit right-winger sniped a shot top-corner for his 15th career OHL playoff goal. The Spirit notched three goals in just 2:02 to take their first lead of the game. Penalties remained an issue for the Spirit in the second frame. Prosvetov’s continued strong play helped Saginaw kill all three of Sarnia’s second period man-power advantages. Saginaw took a one-goal lead into the third period despite being outshot through two periods, 28-10. The Spirit took a two-goal lead just over six minutes into the third period on the man-power advantage with Perfetti’s first career OHL post-season goal. McLeod sent a perfect cross ice pass over to the Saginaw rookie in the left face-off circle. Perfetti sniped a wrist shot top-shelf on the short-side. The Sting’s Grima answered just 22 seconds later to make it a one-goal game again. Leufvenius found the Sarnia defenseman in the slot and Grima beat Prosvetov with a backhander. Saginaw got the goal back with just over seven minutes remaining in regulation on a great individual effort by Wilde. The Spirit defenseman deked around two Sarnia defenders and popped a snap shot through Langevin’s five-hole for the goal. The Spirit added an empty-net tally with Tippett’s second goal of the game with a shot from the neutral zone to make it a 6-3 game. 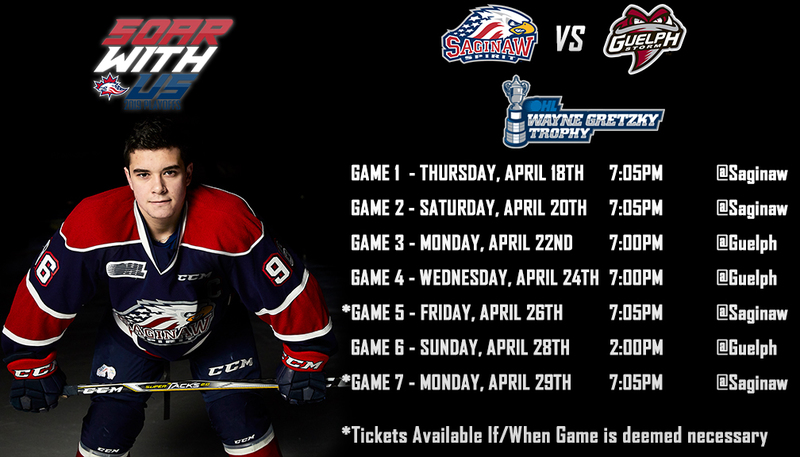 Game two of the first-round match-up between Saginaw and Sarnia is Saturday, March 23 at The Dow Event Center. Puck drop is set for 7:05 p.m. as the Spirit will attempt to take a first-round two-game lead.